My daughter has been a kindergarten student for four days now. She tells me, “I don’t just like kindergarten. I don’t just love kindergarten. I ADORE kindergarten!” She is anxiously awaiting homework and keeps asking when will be the long-awaited day when homework is placed in her folder. My son- a second grader- is not nearly as excited about homework. He was the king of homework passes last year and would happily never do homework again. My new third grade students ask me each day, “Do we have homework?” There have only been four days of school for us and I haven’t had the chance to explain to them how homework will go this year. Homework leads to different emotions from different kids at different ages. 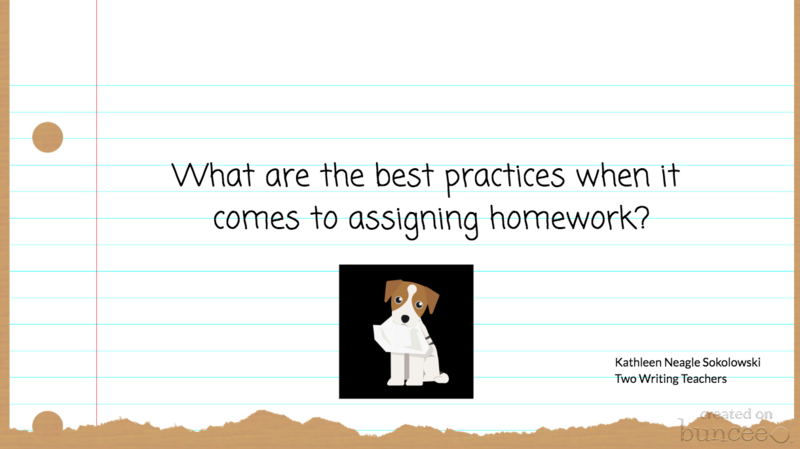 What are the best practices when it comes to assigning homework? My thoughts on assigning homework have evolved through the years, as I detailed last year in this post. Some of the TWT co-authors tackled the issue of homework last year in a mini-series, which you can read here. In my school, my principal has shared research with us from John Hattie about the effects of homework on student achievement in the elementary school. The bottom line is that homework has very little influence on student achievement at the elementary level and can actually lead to negative attitudes towards school and learning. On Long Island, where I teach, a neighboring school district has shifted its homework policy for elementary students, getting rid of traditional homework. This will be my second school year where I emphasize reading after school and embracing “home learning opportunities” instead of assigning homework. If you are on the fence about making the switch, I hope reading about my experiences gives you the courage to try it out. Alfie Kohn’s recent article “Encouraging Courage” calls for educators to step out of what’s always been done and be brave and reflective about what works best for kids. Is the homework you are assigning making a positive difference in your students’ learning? For me, assigning homework was challenging for several reasons. My students are academically diverse, so lessons are often small group and targeted to their current needs. When time is of the essence, can I create homework assignments for multiple groups in multiple subjects? No- it is not possible. Is it advisable to send the same homework assignment to children at different levels of ability? Not really. Some kids will be bored, others will struggle and it isn’t a match to what they specifically need. Then, after students complete all this homework, I have to check that each child has done it and give them feedback of some kind on it. Many times, this made me feel like a police officer, interrogating a child on why the homework wasn’t completed. It made for negative feelings all around when students did not do their homework. With many children coming from a second language background, or with parents working an afternoon/night shift, is it fair to penalize children who do not have an adult at home who makes sure the homework is done? It felt like an equity issue to me. Students from a more privileged background, who had a grown-up to sit with them and help them complete assignments were praised and given extra points or prizes for their compliance. Students who did not have academic support at home were punished, had points deducted, and were made to feel like they were irresponsible. There was also the issue of time in the classroom. It takes third graders SO long to copy down assignments. Students with attention issues or fine motor issues would really struggle with this task and often needed me to write their homework down for them, check their planner, or sign that I’d seen it. I started thinking about Hattie’s research and the effect homework had on achievement. Couldn’t our time be better spent instructionally rather than all of this assigning, writing, checking, and rewarding/punishing? With so many classrooms moving to digital type assignments (like in Google Classroom) is copying down a homework assignment a skill students will need going forward? All of this led me to rethink homework and emphasize reading after school as the only expectation. While I would not make parents sign a log, I shared with them how very important it is that students make time to read each day after school. I also created monthly menus of Home Learning Opportunities to provide students with enriching activities that support our curriculum. While I hope my students write after school, I don’t mandate it. Instead, I establish blogs for each child through Kidblog. 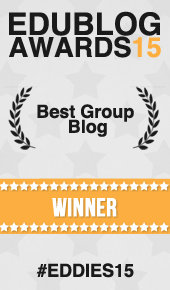 Students can choose to write on their blog after school or on the weekends. This year, I created a chart of questions and answers related to my homework policy. I will be sharing this with parents in my class at our Open School Night later this month. I put into a Google Slide presentation for this post. It can feel scary and uncertain to step away from a traditional practice like assigning homework. Following your teacher heart (and your gut) and reading what other professionals and researchers have shared can make you feel more confident in taking a risk and trying a new policy. As I read The Koala Who Could to my homework-loving and homework-hating children, the quote on the back made me think of shifting our long-standing practices that might not work anymore: “Sometimes a little CHANGE can open your world to BIG possibilities.” The last line of the book reads, “Because life can be GREAT when you try something NEW!” I would say the classroom could be great, too, when we question and change practices that do not work for many of our students. What new idea will you try this year for your students? What old practice might you change or adapt to create more meaningful learning experiences? This is such a timely post as our third grade team is working towards introducing new hw practices similar to what you have tried. Thanks for paving the way and showing us it can be done! About 3 years ago and after watching “Race to Nowhere” our school changed its primary level homework requirement. Now all they need to do is read every day and have parents ask comprehension questions. Most parents embraced the idea but of course, there were some that really wanted work for their child. What I do in my classroom it’s called “Bonus Homework”. I put about three suggestions for something that has to do with what is being taught or had been taught. The very last one always says do your own homework. OMGOSH, I was floored with what the kids are bringing in. They have to present it in front of the class. They have to tell us why they chose it. I have had children come in with math games, 3D rollercoasters made out of cardboard, origami animals, stories stories stories. It’s homework I would have never been able to imagine. Anyway, I could go on and on about what they have brought in. I’m looking forward to what I’m going to encounter this year. One of the most powerful practices we have suspended in starting our school is that of assigning homework. What we have found is that students actually do work on home by choice, extending their learning about something their curiosity was sparked about and/or their passion ignited. It’s also a huge relief for our parents who crave family time in the evenings rather than a struggle to force their children to do homework they may not be equipped to help them with after they are all exhausted from a full day’s work or school. We believe that children should be children. After they work with us all day from 9:00-4:00, they should be engaged members of their family, their church, their sports team, etc. Isn’t it richer for us to watch them demonstrate their thinking while in our care anyway? Doesn’t that tell us what we really need to know? Great post! Homework is always a tricky situation in most households. I applaud this mindset shift especially since there is no conclusive data that backs its usefulness. I love that reading is encouraged as a daily practice. Reading consistently (daily) increases a student’s chance for academic success. Your slide deck is amazing. I am doing this type of “homework” as well. I will be using some of your information as questions arise. Thanks for sharing! Isn’t it? I cannot think of a single question Kathleen didn’t provide an answer for. It is a great resources, isn’t it? Thank you for this post Kathleen! This is a question so many teachers grapple with, and it is a huge challenge to step away from the norm. I would so much rather see kids spending time with their families doing things together (reading, eating dinner, TALKING) than having them complete homework for the sake of homework. I appreciate you including resources and research to back up the stance as well! You are singing my (non) homework song, Kathleen! Not to mention the research: “The bottom line is that homework has very little influence on student achievement at the elementary level and can actually lead to negative attitudes towards school and learning.” I’ve seen teachers assign loads of homework and students pulling it from bookbags in the mornings only for the teacher to put a check on a checklist. What’s the point? There’s no time for learning that’s not authentic… this is not even learning. Homework is often just empty rote, hoop-jumping with no real purpose. Teachers despair over students who don’t do it and if they don’t send it, parents want to know where’s the homework? It’s past time for a paradigm shift… thank you always for your courage.